Smith Elementary School teacher P.J. Terry walks a group of 14 students through creating their Dungeons and Dragons characters Thursday morning before school. Terry said he hopes the game teaches students about how to creatively solve problems and how their actions have consequences. 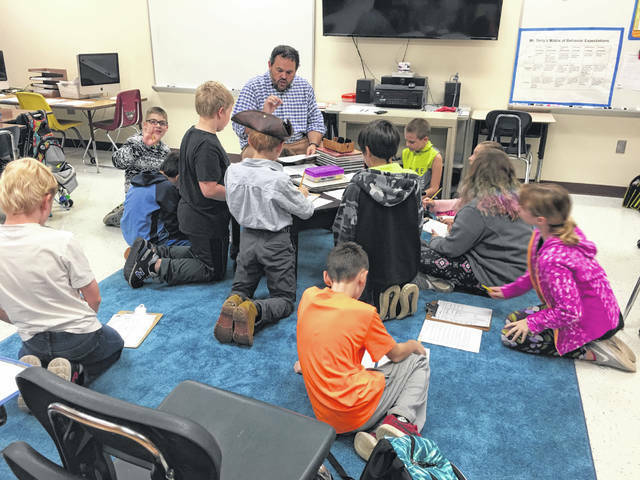 A group of 14 Smith Elementary School students arrived an hour before school started Thursday morning for the first meeting of a newly formed Dungeons and Dragons group. The group’s organizer, fourth-grade teacher P.J. Terry, said that the club is called “D&D, E+R=O,” and it was created to give students a new way to look at how “Events” and their “Responses” to those events create “Outcomes” (E+R=O). Terry added D&D has experienced a bit of a resurgence in popularity after being featured on shows like “Stranger Things,” and he was partially inspired by the popular YouTube series “Critical Role” where a group of professional voice actors play Dungeons and Dragons together. Terry decided he would try to put together a club to see if any fourth- and fifth-grade students were interested in learning how to play. He originally thought he would get about 10 students signed up, but was shocked when 42 students signed up to join the club, which has since been divided into three groups of 14 students that will meet once a month, an hour before school. Terry said he hopes to give students an opportunity to creatively think about their actions and consequences. Terry said the group will also be an opportunity to build relationships for students. Terry added he also sees the group as a creative outlet for the players. “I’m really going to be pushing for creative writing. A lot of times the writing we do is personal narrative or informational, and I really want them to have a creative writing outlet,” Terry said. Fifth-graders Chloe Titus and Bridgette Spires said Thursday that they joined the club because it seemed fun. Spires said the group spent Thursday creating their characters, and she’ll be playing a ranger character in the game. Titus, who will be playing a barbarian character, said she learned a lot about the game Thursday. Terry said he’ll meet with the next group of students next Thursday before school.